April has been a month of crafting with the children. From activity night at my son’s school to Easter holidays, we’ve been getting our craft on as a family. At the beginning of the month, together with a group of equally enthusiastic moms, I helped deliver Activity Night at my son’s infant school. We organise an Activity Night every year, this year the theme was ‘colour carnival’ and we had two crafty sessions to organise. The first was a carnival rain shaker where the children added coloured rice into a plastic bottle and then decorated the outside of the bottle. This makes a fantastic handmade musical instrument and the kids had great fun making lots of noise with them. After a quick search on Pinterest I discovered the easiest method to create fantastically colourful rice for crafting. The full tutorial is on my blog but essentially you just add gel food colouring to vinegar, mix in the rice, and leave it to dry. I had so much fun preparing the rice and the colours were so uplifting. It was a real feel-good craft. There is so much that you could use this for besides rain shaker musical instruments. How about using the rice in a shaker card or letting the kids loose with some large paper sheets and PVA glue to create textured collages? They could create fantastic scenes using the different colours. During Activity Night itself I helped the children decorate their masks. They were given coloured pens, foam shapes, sparkle gems, sequins and feathers. It was amazing how much of their personality was reflected in their mask design. Some were very intricate and delicate with their designs and some stuck as many embellishments as they could! Some included their name, their favourite colours or drew things that they liked such as rainbows and unicorns, others created a superhero, a princess or a character and then became that character when wearing the mask. It was great afterwards to speak to parents who said their children weren’t crafty – my son included – but this activity certainly bought out their design skills and creativity and I could see a few crafters of the future amongst the groups. I have also been crafting with the kids at home. During the Easter holidays I took some time off work but needed a crafty fix. My daughter and I spent a fabulous crafternoon with the free Trimcraft downloadable Easter papers available in the downloads area of the web site. The great thing about these papers is that they can be reprinted so you never run out and you’re not worrying about how much of your precious crafty stash the kids are using. I love spending time crafting with the children as it’s great for their creativity. 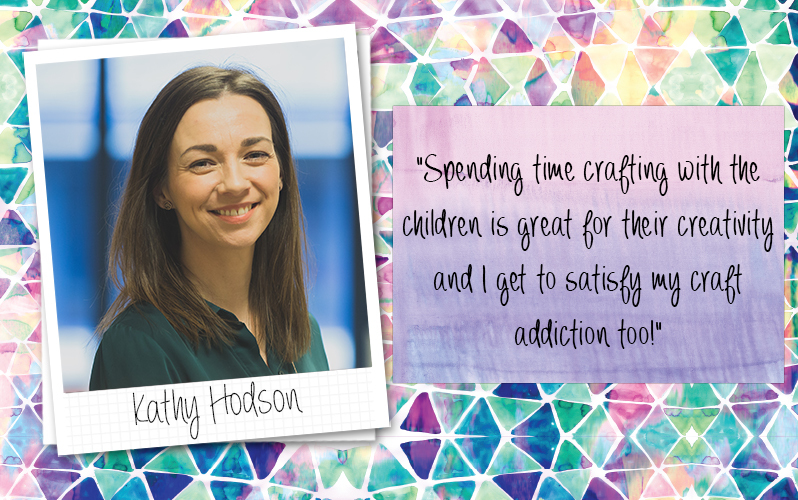 It allows us to spend one to one time together and I get to satisfy my craft addiction too! My daughter took great pride in her finished items, displaying them around the house and giving them to family on Easter Sunday. She even made a basket working out herself how to make the sides and handles. She couldn’t wait to fill it with her Easter treats!